There's always zucchini bread, and zucchini fritters, zucchini muffins, ratatouille ... 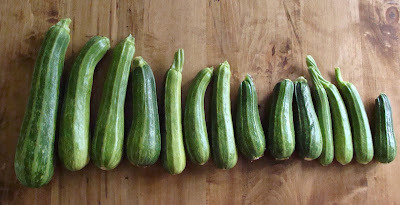 There's a saying in the U.S. South -- people lock their cars up in the summer so nobody will leave their extra zucchini! I remember feeling exactly this way with my all eggplants this summer. Now that my garden isn't producing anything I miss that feeling. Ah to have countertops overflowing with zucchinis! If it's any consolation, the zucchini/courgette phobia has now disappeared for my daughter in mid teens. Let us know if the chocolate cake is a hit! My sentiments exactly. Courgettes in particular always win in the end. I've done the bread and the cake - it's soup today! I've head that you can make bread and butter pickles out of zucchini. I haven't tried it yet because despite having 3 plants my first female flower only bloomed yesterday! We enjoy zucchini soup as well. mm, chocolate zucchini cake sounds good. Frozen grated zuc's make nice winter baking as well. Zucchini relish is really good too. I want more zucchini to grate for the winter. I have four plants. I ought to be getting too many, but they just peter in. I know what you mean about the anticipation of getting your first then over time as you have way too much you just can't eat it all. I'm that way with my cherry tomatoes right now. I picked pounds of them today and just can't eat them all. I keep wondering if I can make tomato sauce from cherry tomatoes. The cake was fine. Not the best chocolate cake I've ever had, but it all vanished in 30 minutes (even Child #2 ate it (in the certain knowledge that it contained zucchini!!)). Daphne - I would definitely go for the tomato sauce with cherry tomatoes. I used them for that purpose last year. I oven roasted them for 30 minutes (with olive oil and some garlic (and I know you've got plenty of that!)) and then pressed them through a sieve to take out the skin and pips. Tasted great! I'm wondering if it would work with squash. I tried grated carrot in bread once but it got picked out, tiny bit by tiny bit - along with loud sounds of aggrieved disapproval. Sounds like zucchini freezes really well -- just slice, dice or shred, and pop into freezer bags, squeeze out the extra air (or siphon it out with a straw), label and pop back in the freezer. I'm also a big fan of grilled zucchini, with lots of garlic.